Aralia edulis Siebold & Zucc. 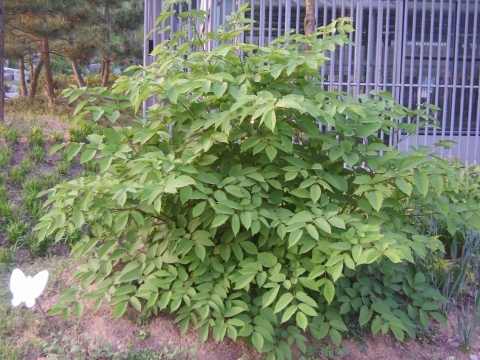 Aralia nutans Franch. & Sav. Dimorphanthus edulis (Siebold & Zucc.) Miq. Udo is a perennial plant growing about 1.8 metres tall. An on-line version of the flora - an excellent resource. E. Asia - China, Japan, Korea. Growing from Seed. Volume 2. Very readable magazine with lots of information on propagation. An interesting article on Ensete ventricosum. ]. Tolerates a pH in the range 5.0 to 7.4. Not very comprehensive, it seems more or less like a copy of earlier writings with little added. ]. When large enough to handle, prick the seedlings out into individual pots and grow them on in light shade. Once the plants are 25cm or more tall, they can be planted out into their permanent positions. ]. Very easy, the suckers can be planted out direct into their permanent positions if required.